Bonnie shamelessly smoking as she crossed the Margaret Hill Hunt Bridge. I had the pleasure of being one of the storytellers for Oral Fixation's Miss the Boat show on April 23, 2013. Here's my Oral Fixation storyteller profile. 2013 was my third year to participate in the Visual Speed Bump Tour; a self-guided tour of artists' studios in Oak Cliff. Jamie Laughlin of the Dallas Observer had fun peeking into some of the artists' bathrooms on the 2013 Speed Bump Tour. I'm honored mine made the grade in her humorous review of the tour. Review of the 2012 Oak Cliff Visual Speed Bump Tour in the Dallas Arts News. Roundup of the artists and community groups that participated in La Reunion's Parade of Giants. 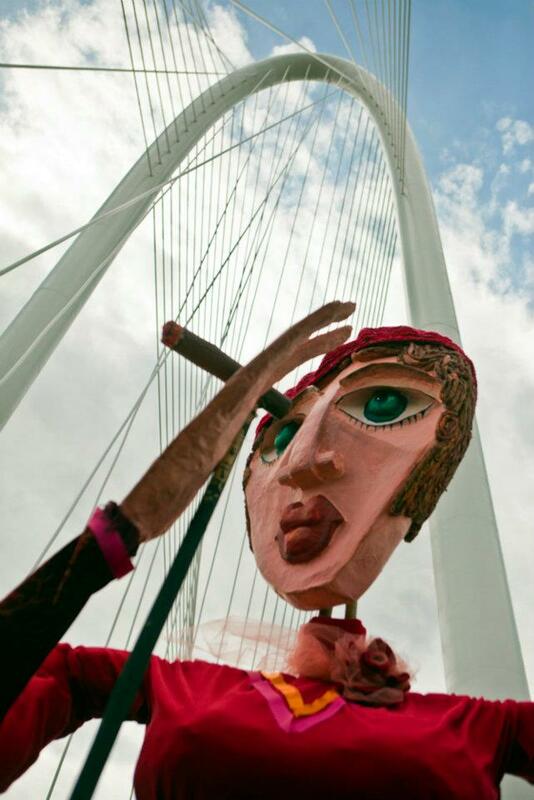 Building my puppet, Bonnie Parker, and marching with her and my community organization, the Fort Worth Avenue Development Group, over the Margaret Hill Hunt Bridge on the opening weekend was one of the highlights of 2012 for me. This video from The DMN of the Parade of Giants has some great shots of my puppet - look for the lady in red! Read more about the parade here. IMBD award page for my Daytime Emmy Awards in 1998 & 1999. Attending an Emmy award show was pretty damn cool; winning one of my own (two years running) was incredible!